The following article appeared in the New Zealand Herald newspaper weekend edition dated 4/5 January 2003. A text version is included below the article and is easier to read. So are the inaccuracies. When you're finished reading, click on this link to see some images from two of Miki's albums. 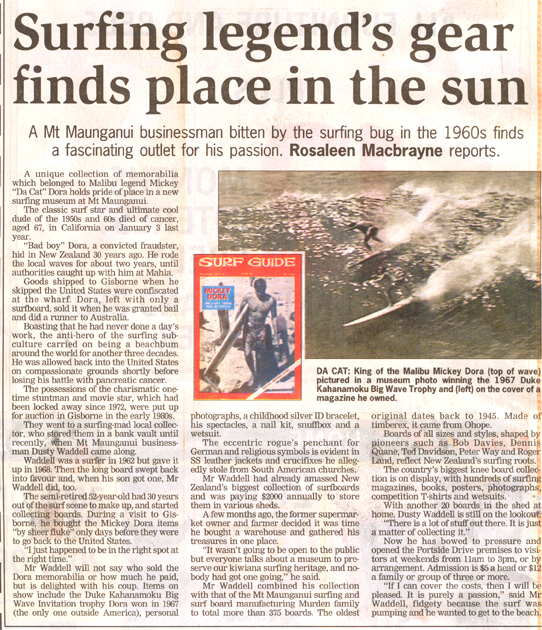 A Mt Maunganui businessman bitten by the surfing bug in the 1960s finds a fascinating outlet for his passion. Rosaleen Macbrayne reports. A unique collection of memorabilia which belonged to Malibu legend Mickey "Da Cat" Dora holds pride of place in a new surfing museum at Mt Maunganui. The classic surf star and ultimate cool dude of the 1950s and 60s died of cancer, aged 67, in California on January 3 last year. "Bad boy" Dora, a convicted fraudster, hid in New Zealand 30 years ago. He rode the local waves for about two years, until authorities caught up with him at Mahia. Goods shipped to Gisborne when he skipped the United States were confiscated at the wharf. Dora, left with only a surfboard, sold it when he was granted bail and did a runner to Australia. Boasting that he had never done a day’s work, the anti-hero of the surfing subculture carried on being a beachbum around the world for another three decades. He was allowed back into the United States on compassionate grounds shortly before losing his battle with pancreatic cancer. The possessions of the charismatic onetime stuntman and movie star, which had been locked away since 1972, were put up for auction in Gisborne in the early 1980s. They went to a surfing-mad local collector, who stored’ them in a bank vault until recently, when Mt Maunganui businessman Dusty Waddell came along. Waddell was a surfer in 1962 but gave it up in 1968. Then the long board swept back into favour and, when his son got one, Mr Waddell did, too. The semi-retired 52-year-old had 30 years out of the surf scene to make up, and started collecting’ boards. During a visit to Gisborne, he bought the Mickey Dora items "by sheer fluke" only days before they were to go back to the United States. "I just happened to be in the right spot at the right time." Mr Waddell will not say who sold the Dora memorabilia or how much he paid, but is delighted with his coup. Items on show include the Duke Kahanamoku Big Wave Invitation trophy Dora won in 1967 (the only one outside America), personal photographs, a childhood silver ID bracelet, his spectacles, a nail kit, snuffbox and a wetsuit. The eccentric rogue’s penchant for German and religious symbols is evident in SS leather jackets and crucifixes he allegedly stole from South American churches. Mr Waddell had already amassed New Zealand’s biggest collection of surfboards and was paying $2000 annually to store them in various sheds. A few months ago, the former supermarket owner and farmer decided it was time he bought a warehouse and gathered his treasures in one place. "It wasn’t going to be open to the public but everyone talks about a museum to preserve our kiwiana surfing heritage, and nobody had got one going," he said. Mr Waddell combined his collection with that of the Mt Maunganui surfing and surf board manufacturing Murden family to total more than 375 boards. The oldest original dates back to 1945. Made of timberex, it came from Ohope. Boards of all sizes and styles, shaped by pioneers such as Bob Davies, Dennis Quane, Ted Davidson, Peter Way and Roger Land, reflect New Zealand’s surfing roots. The country’s biggest knee board collection is on display, with hundreds of surfing magazines, books, posters, photographs, competition T-shirts and wetsuits. With another 20 boards in the shed at home, Dusty Waddell is still on the lookout: "There is a lot of stuff out there. It is just a matter of collecting it." Now he has bowed to pressure and opened the Portside Drive premises to visitors at weekends from 11am to 3pm, or by arrangement. Admission is $5 a head or $12 a family or group of three or more.